Sometimes, it's really hard to wake up in the morning. You find your eyes glued shut for some unknown reason, despite the fact that you got 8 or more hours of sleep. What you really need now is the perfect cup of coffee; otherwise there’s really no possibility that you’ll make it into work on time today. If you’re a coffee aficionado, you're probably looking for a product that’s going to extract the flavor from your beans as quickly and effectively as possible to help get you up, moving, and out of the door in a timely fashion. 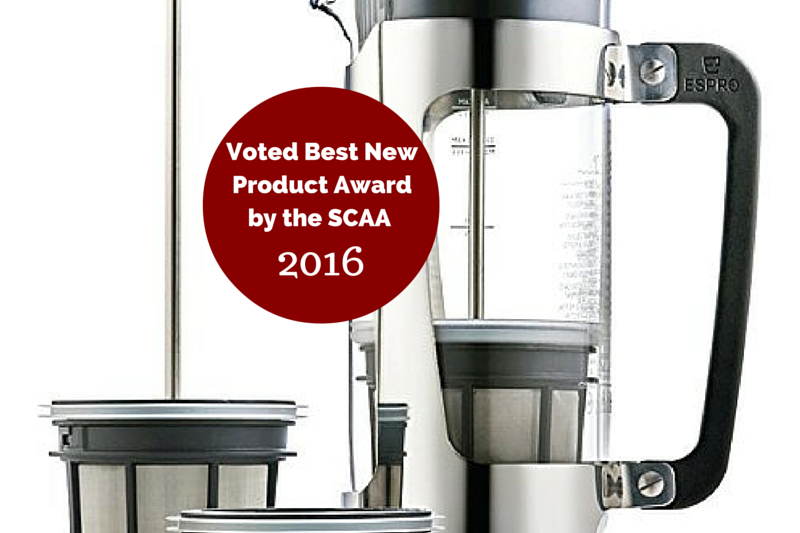 As the winner of the 2016 SCAA award, the Espro P5 Glass Press is no slouch. It was voted the overall best new product, because of the amazing design, thick glass, and perfect grit-free design (that we'll talk about more in this article). That’s one of the reasons why the Espro P5 Glass Press is a good option. It delivers a robust and full flavor that you just can't get from a coffee pot or Keurig, but it's technologically advanced to ensure that all of your coffee grinds are extracted well, and that it's not going to tip over and spill or fall and break with its security lock feature. There are a lot of different kinds of espresso or french press machines out there, but many of them leave grinds in the bottom of your cup or over extract the coffee beans until you really don’t want to drink it. The end result is bitter, flavorless beans without a toasty feel, meaning that you’re going to be disappointed. Plus, most french press machines aren’t built to ensure that your coffee stays warm and delicious, because the glass carafes are thin and flimsy, or the metal construction doesn’t complement the design. Espro is not only safer for you with thicker glass, it also better insulates the liquid within delivering a better finished product that stays hot and delicious longer. Another convenient feature about the Espro P5 Glass Press is that it comes with a 25-unit Starter kit of paper filters; ensuring that you can use your new Espro glass press directly out of the box. Many units leave you scrambling to pick up important pieces just to make a cup of coffee, but Espro makes sure that you can make the freshest cup of any house style coffee immediately. These models are exceptionally easy to use, all you have to do is add your grounds, add water, and plunge it down. It automatically separates the grounds (or tea leaves) out without you having to go through any extra effort. Voila! You can then pour a fresh cup of delicious coffee. It's designed to be easy to clean, too- all you have to do is rinse it out and throw it in the dishwasher and it's ready to go next time (filters, plungers and the glass)! While the Espro is pretty pricey (averaging around $60), it's far better than lower priced alternatives. In this situation, it seems like you really get what you pay for, including speedier extraction than other presses, less grinds, and a thicker, more reliable design (with safety locks). This French glass press is completely dishwasher safe. That means you don't have to worry about funky flavors, mold, or filming due to old product. After washing it in the dishwasher, it's like a shiny new product. Most products require you to awkwardly manually wash out the inside of the glass press, leaving dirty spots. Espro didn't design a flimsy model, each unit is well built and will last a long time. Even the filters and coffee plungers have very well-designed filtration systems that leave nothing to be desired. Practically any beverage that needs to be strained through (including herbal teas and Oblong teas). Everything that you need is built right in. You aren't going to have to purchase a tea filter to keep the flavors of different drinks apart. Plus, the Espro P5 pushes tea leaves in separate compartments than coffee, isolating the leaves into the bottom of the device, immediately stopping brewing to get the best flavor. 100% satisfaction guarantee- Espro backs this awesome product with a 100% satisfaction guarantee. This means that if you're not happy about your purchase, you can send it back. Excellent customer service for replacement parts - One of the most impressive aspects of Espro is how much they genuinely care about your needs and what 'makes a good french press'. This product isn't flimsy; but if anything breaks just give them a call and they'll ship you a replacement. 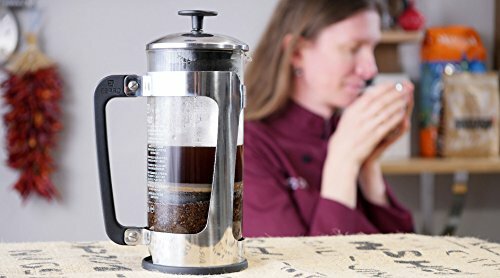 Safe no-slipping or sliding formula beats spills - Many french presses are hard to use and slip around when you're struggling to plunge coffee through the press. 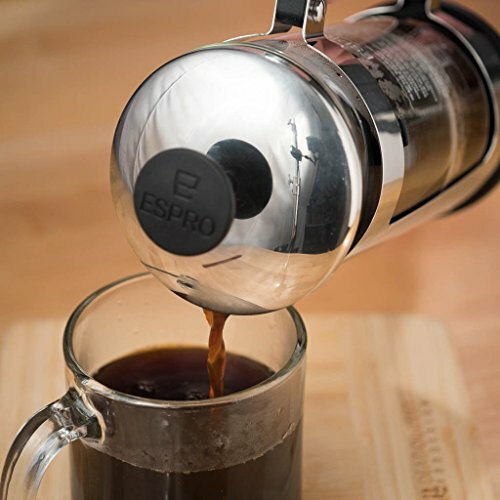 The Espro Press P5 is designed to prevent spilling with a patent-pending lock. This means that if your children try to play with it, at least you can have a little bit of peace of mind that nobody is going to get hurt or burned. The Espro P5 Glass Press is kind of expensive, but it's been designed as the only french press that you'll ever need. The process of making pressed coffee is not for the faint of heart. It will take you a few tries to get the perfect blend, and you might ruin a few batches of coffee grounds before you learn exactly what you're doing. 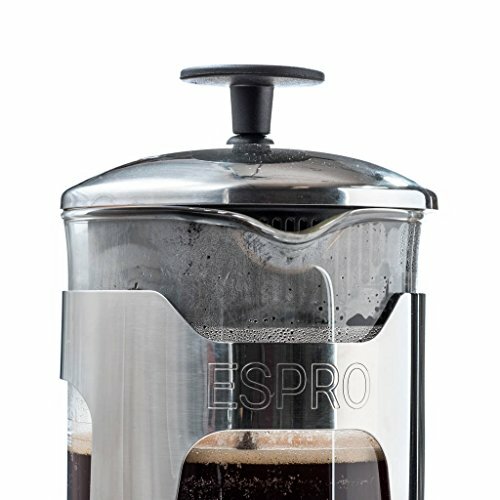 The Espro Press P5 - French Press Coffee Press is available to purchase on Amazon for $58.92. 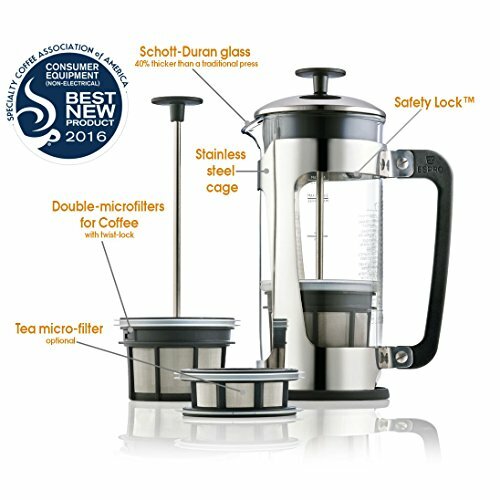 Is the Espro P5- Glass French Press Right For You? No matter what you're buying these days, there's bound to be at least fifty other options of the same product. The problem is, when you're buying products in this fashion, you never know what you're going to get (so you have to be careful and make sure you do your research). The Espro P5 delivers reliability every single time you use it, which is well worth the cost in my opinion. Aside from the pricing, this model has virtually every feature you would ever need. It lets tea connoisseurs make tea in a breeze, as well as spectacular coffees with minimized clean up and effort - making this product well worth the purchase price.